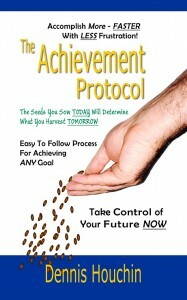 The Achievement Protocol is available through Amazon.com. It is also available in book stores and other online retailers. It differs from other self-help books because it provides an easy to use process that takes the most essential elements of Strategic Management, Project Management and Time Management and brings them together in a way that can be followed by virtually anyone at any stage of live to achieve their life’s goal, whatever that may be. After you’ve read the book, I encourage you to go to Amazon.com and write a review of the book. A quality review and appropriate star rating will help other potential readers know what to expect, and it will also help me to better understand what affects my readers. Please feel free to share this post on your Facebook page and let your let your friends know you are using The Achievement Protocol.